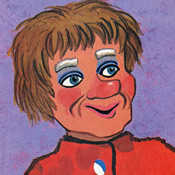 Lady Elaine Fairchilde first appeared on the Children’s Corner as a very unique, self-confident, and eccentric woman who operated the Rapid Walking Beauty Counseling and Professional Bridesmaid School in the Trolley Barn. 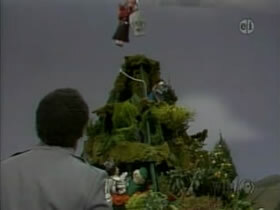 Carrying over to Misterogers and through the run of Mister Rogers' Neighborhood, she moved from Someplace Else and took over as the curator of the Museum-Go-Round upon the departure of the Frogg family. 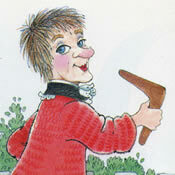 Lady Elaine is the Neighborhood mischief maker and, having learned from the Wizard of Lupovich, often uses her Boomerang-Toomerang-Soomerang to do things such as rearrange the Neighborhood or to turn it upside down. 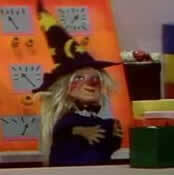 She is credited with the discovery of Planet Purple which she found while flying in her spaceship. 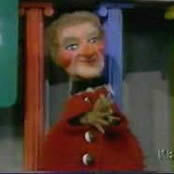 Lady Elaine also owns a helicopter named Yo-Yo and once opened a pie restaurant in the Neighborhood of Make-Believe. 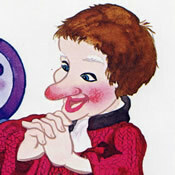 Lady Elaine Fairchilde is a long-time friends of Betty Okonak Templeton and Barbara Russell. 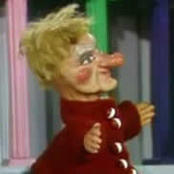 Twice, Lady Elaine mistakenly thinks she is engaged to be married -- once to Corney  and then to Neighbor Aber. 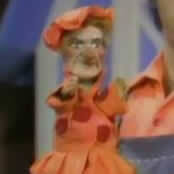 Lady Elaine also has a sister named Barbara  and regularly addresses others as "toots." 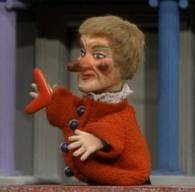 According to a Neighborhood census, Lady Elaine can whistle and her favorite color is red. 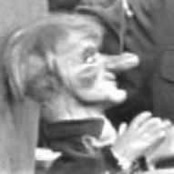 She plays the piano, the accordion, and the oboe and is the acting manager of MGR-TV where she produces a soap opera, As the Museum Turns. 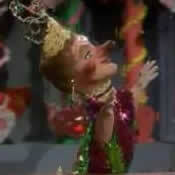 A glimpse into Margret H. Witch’s crystal ball reveals that Lady Elaine will live to be at least 250 years old. 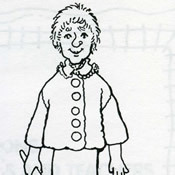 Lady Elaine knit her own sweater  and celebrates her birthday on February 21st. 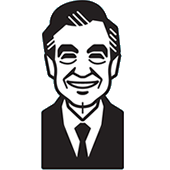 According to the Archive for American Television interview with Fred Rogers: "My sister was adopted when she was six months old and I was eleven years old. 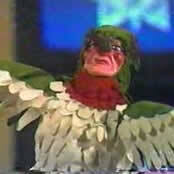 And her name is Elaine. 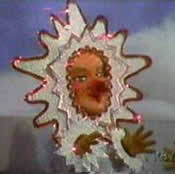 We tease her because she thinks that I must have named Lady Elaine Fairchilde for her." 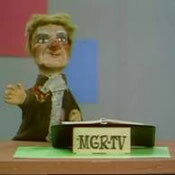 In Episode 1691, Robert Troll delivers a package to Lady Elaine which confirms her middle initial as it is addressed to "Miss Lady Elaine C. 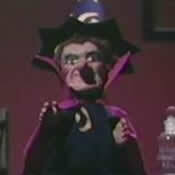 Fairchilde." 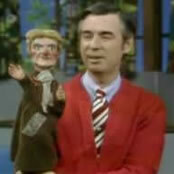 Mister Rogers demonstrates the Lady Elaine Fairchilde puppet in Episode 1384. 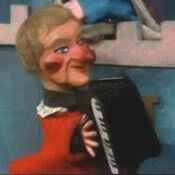 Although Lady Elaine does not physically appear in Episode 1235, her voice is heard calling over the radio from outer space. 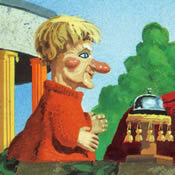 In Episode 1702, Lady Elaine dreams of herself the size of a real human being. 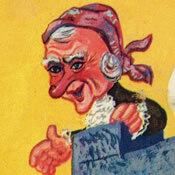 It is unknown who the performer is who plays Lady Elaine in this human-size role. 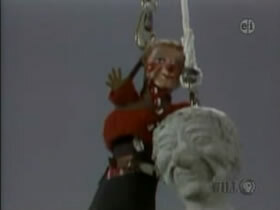 In Episode 1503, as Lady Elaine is lowered to the mountaintop with a sculpture of her own head, a rare glimpse of her full body can be seen. 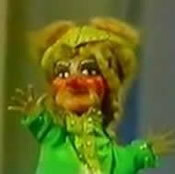 Lade Elaine does not visibly appear in Episode 1234; however, she plays a prominent role in that episode's Make-Believe segment as he speaks through a squawk box from Jupiter. 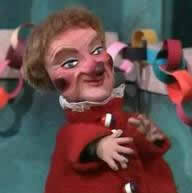 In Daniel Tiger's Neighborhood, Lady Elaine continues to live in the Museum-Go-Round with her daughter Miss Elaina.